We believe our LockLid brand of utility box security lids are the most secure lids on the market today. It’s in the headlines almost daily. Somewhere is the United States bandits are stealing copper. Copper wire worth $460,000 has been stolen from Fremont, CA streetlights in the past seven months. In Fresno, CA, 4,000 of the city’s 41,000 street lights are in the dark. The Arizona Department of Transportation (ADOT) reports that they have had 30 copper wire thefts along valley freeways in one year costing the state $500,000. In [Colorado Springs, CO, investigators believe a group of thieves is responsible for stealing about 6,000 pounds of copper wire. The estimated replacement cost, including labor, is $500,000. The list goes on and on. Anything copper is in jeopardy, including copper wire installed by utility companies and agencies. The number of incidences of theft from in ground utility enclosures, including pull boxes, or access boxes, that control streetlights is increasing dramatically on a daily basis. Towns and cities throughout the United States, such as Sacramento, CA, are discovering that darkened streets and traffic signals are increasingly jeopardizing the safety of drivers and pedestrians while creating an insecure environment for nearby businesses and residents. Copper and aluminum wire theft is costing municipalities, utilities, and DOTs worldwide billions of dollars annually in repair, replacement, and labor costs. On demonstration lids, Jensen MetalTech is using steel with the TraxPlate™ slip resistant surface. TraxPlate™ is a patented process of creating a truly slip resistant surface that is exclusive to Jensen MetalTech. Though lids are also available in diamond plate and smooth steel, TraxPlate™ provides an additional safety feature in areas with pedestrian and/or vehicular traffic. The LockLid™ brand of lids also feature Bryce Fasteners. Bryce is the world leader in high security locking bolts and screws. The Glendale, Arizona based company engineers and manufactures locking bolts and screws with distinctive heads that require a special key to open. The keys are strictly controlled by Bryce assuring that they go only to the end users. Unlike other tamper resistant bolts on the market, such as penta head, the keys are not sold in any retail outlets, online, or through distributors. Bryce also designs and manufactures one-of-a-kind security bolts and screws for customers who what their own, unique key. The first series of security lids carrying the LockLid™ brand is the K-Series. The patent pending locking mechanism works with the use of a cam. 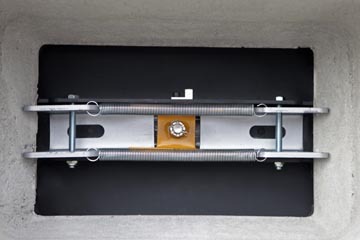 When the secure fastener is tightened, the cam spreads braces outward to grab the inside of the pull box, or handhole, with each set of braces creating a four point connection. The number of braces is dependent upon the size of the lid. In field tests, two pull boxes were cast into a 3,000 pound concrete apron. LockLid™ K-Series lids were locked into place. Pull handles were welded onto the lids to allow a forklift to be hooked up to the handles via chains. As the forklift pulled up on the chains, the grasp of the braces inside the boxes was so powerful that the boxes, along with the 3,000 pound concrete slab, were actually lifted out of the ground in one piece – while the lids stayed securely locked into place. “I sincerely believe, once our LockLid™ K-Series lids are installed and the thieves learn how extremely hard they are to break into, they will just move on to other less secure lids to break into,” said Eric Jensen, CMO of Jensen Precast. “We’re excited that we can bring these lids to market at such an opportune time to save money for utility companies and municipalities throughout the country. On the exterior, the LockLid™ K-Series lids also feature specially designed pick holes. For added security, the pick holes are smaller than others on the market today. When the lids are locked into place on the boxes, the braces under the lid actually seal off the pick holes. The sealed pick holes offer several advantages, i.e. potential thieves cannot get a bolt or other device through the holes; dirt and debris cannot fall into the box; nothing can be stuck through the holes that may come into contact with wiring inside the box creating an electrocution hazard. Another attribute of the LockLid™ K-Series is the addition of a grounding lug eliminating the need to be retrofitted at the time of installation. 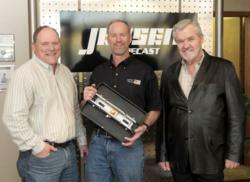 About Jensen MetalTech – Jensen MetalTech, a division of Jensen Precast, manufactures steel and aluminum products. Their main business is designing, engineering, and producing access hatches, doors, covers, lids, grates, and slip resistant surfaces for utility applications such as in-ground utility vaults, utility boxes, ladders, stairways, cat walks, etc. as well as manufacturing companies. Originally established to provide sheet metal hatches and covers for precast concrete products companywide, including the pump and lift division of Jensen Precast, Jensen Engineered Systems, Jensen MetalTech products are now shipped throughout the country. About Jensen Precast – Jensen Precast, founded by Don Jensen in 1968, is one of the largest independently owned precast concrete manufacturing companies in the United States. With corporate headquarters in Sparks, NV, Jensen Precast has 12 production facilities throughout the Southwest and Hawaii. Jensen Precast designs and manufactures standard and custom precast concrete products to meet small to large-scale infrastructure demands. Jensen Precast products are made in America and are used in highway construction, retaining walls, electric and gas utilities, telecommunications, stormwater capture and treatment, rainwater harvesting, on-site wastewater, sewage applications, above ground fuel storage, agriculture, landscaping, and more. How does the LockLid K-Series security lid work? A view from below of a LockLid K-Series security lid locked into a utility pull box. In field tests, LockLid K-Series lids lifted a concrete apron weighing approximately 3,000 lbs.